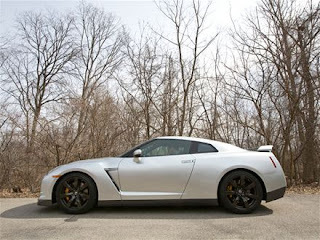 Automobile Magazine just received a 2010 Nissan GT-R for long term testing from Nissan. Our test car has Nissan's newly calibrated launch control setup, explains Bruce Robinson, senior development engineer for Nissan Tech Center North America, who delivered the car to our offices. "Previously, [our launch control] came out at 4500 rpm in first gear with one foot of rear-wheel spin, and then the fronts would grab," Robinson continues. "With our new calibration, we launch at 3000 rpm because there's more midrange turbo boost. It works [with the dual-clutch automatic transmission] in either manual or automatic mode, but the quickest way is just to leave it in automatic and let the engine shift at redline." In short, Robinson says, put one foot on the brake and floor the accelerator with the other, but be sure to leave VDC (stability control) on, lest we void the warranty. The 2010 car gets a 5 hp bump to 485 hp, new darker wheels, revised spring rates and dampening, and a couple of other minor changes.